Rent table mirrors for your Chicago special party event. 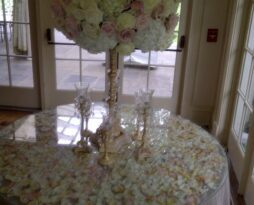 We rent small centerpiece mirrors or large full table mirrors and glass. Full-table mirror rentals is high-class and it brings the room onto your table. Rent this table top glass for your Chicago event to really create a custom card or entry table. These custom crafted round table glass pieces really bring the event onto your table. The glass can be lifted 1/2 inch off the table so that you can customize the table top. You can add flower petals, pictures, images, or anything creative to make a statement on the event your guess are about to take part in. We carry only 1 table glass per size in our inventory. 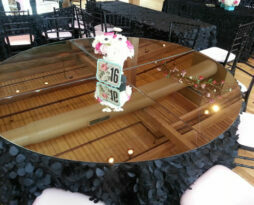 This centerpiece table top mirror rental is used to show case your table’s centerpiece or floral arrangements. 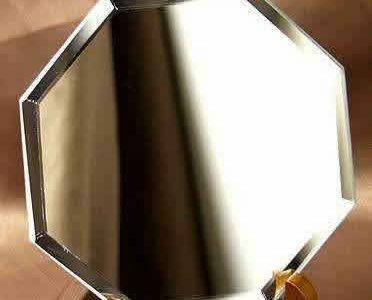 The octagon shaped table top mirrors have a soft angle beveled edge. Rent these table top mirrors for your Chicago event to really change the décor in your room. These custom crafted round and rectangular table mirrors really bring the event onto your table. Whether its bringing your beautiful event ceiling, sky, or event lighting these table mirrors really do the job. We carry approximately 40 table mirrors in our inventory for 6 foot round tables. If ordering more than 30, please call us to identify your exact count needed before placing any order. For rectangular table mirror rentals, we only carry a few tables mirrors in stock. Rectangular table mirror rentals are primarily used for head tables, product displays, back bars, parties, and tradeshows.